Eden Hazard hailed Olivier Giroud as the best target man in the world after the pair combined to spearhead Chelsea’s convincing 4-1 victory over Cardiff City. 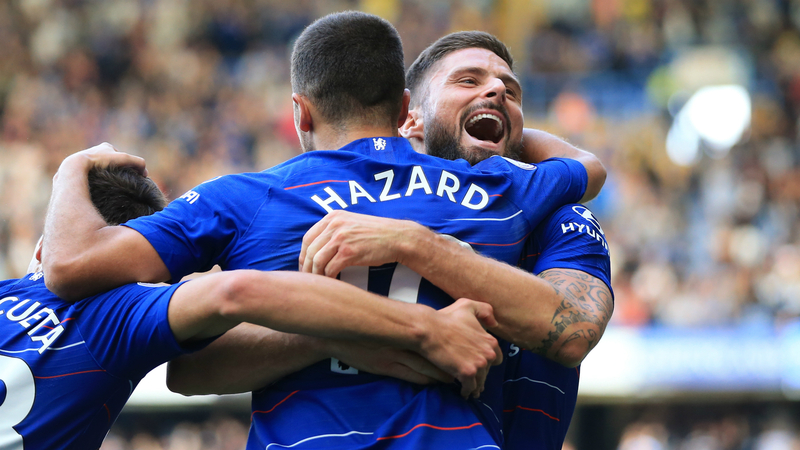 Called in for his first start of the Premier League season, Giroud repaid Maurizio Sarri’s faith by teeing up the first two goals of Hazard’s sublime treble at Stamford Bridge. The classy performance continued the France striker’s upturn in form after he broke a 10-match international drought with the winner in a 2-1 defeat of Netherlands last weekend. Hazard highlighted Giroud’s physicality, in contrast to that of Alvaro Morata, as making him the perfect partner in attack. “He’s a target man, maybe the best in the world. I think so,” the Belgium star told BBC Sport. “He can hold up the ball… it’s a pleasure to play with him. When Alvaro is playing it’s completely different, he’s a different player to Olivier. Hazard was the driving force in maintaining Chelsea’s perfect start to the season, striking twice before half-time to erase Sol Bamba’s shock opener and later adding a third from the penalty spot. “We have a lot of freedom on the pitch and, at the moment, when we try and do something it’s coming off,” he said. “I’m always happy when I’m playing football.